I could almost hear a sigh of relief from Tantor as we slowed to a park in front of Grandpa’s townhouse. 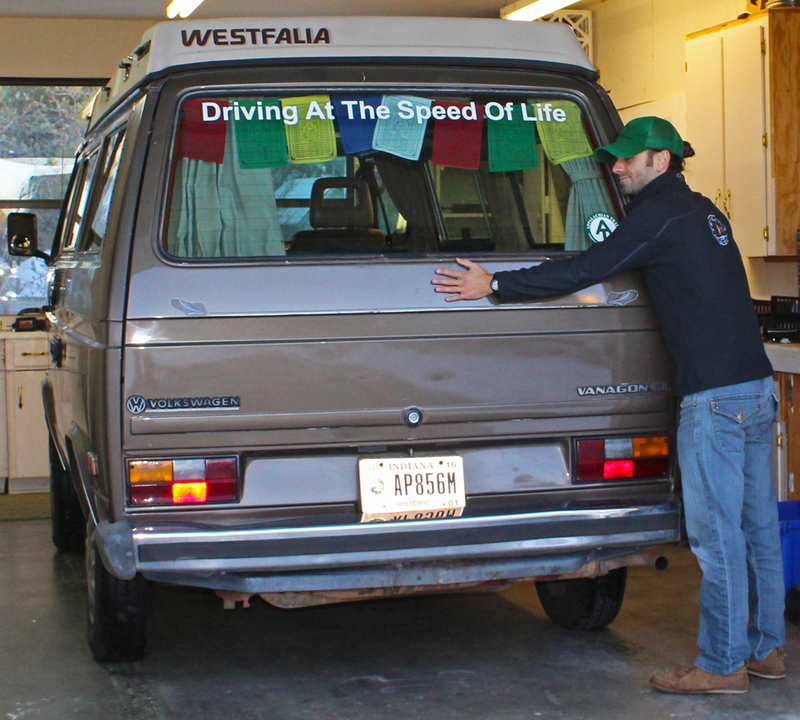 20,000 miles in 5 months was a lot to ask of a 30 year old van, and despite a few tow truck rides, our circumnavigation around the United States had been a success. I unpacked (read as “I moved my foam mattress and sleeping bags into Grandpa’s spare room”) and settled into a less nomadic lifestyle for a few weeks. The first thing on the agenda was to catch up on work. Cruising from Florida to Arizona in 10 days meant that making money had taken a backseat to seeing old friends and exploring new places. But alas, the gas tank needed to be filled, so work had returned to the top priority. A few days before Thanksgiving Kyle and Jen drove through on their way to Los Angeles and we grabbed some cold beers and hiked around Watson Lake. Thanksgiving was spent indulging in copious amounts of good food, followed by cold drinks and catching up with family. 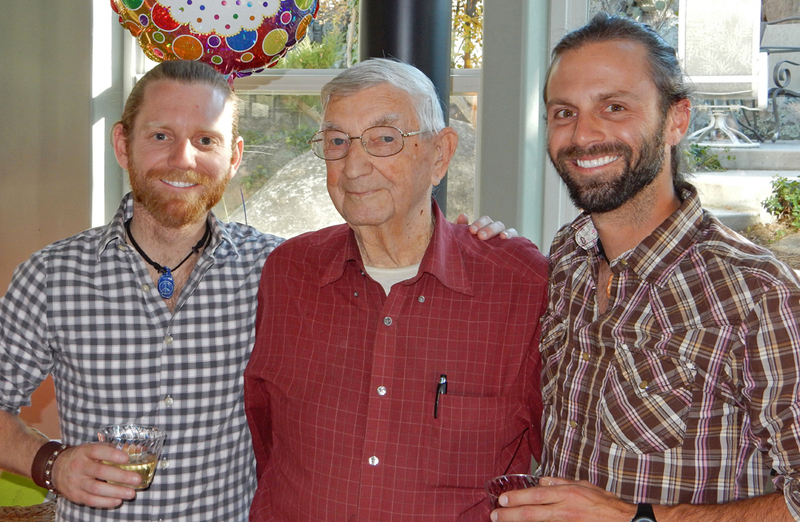 A day after Thanksgiving my mom and step-dad arrived from Indiana and everyone began the big 90th birthday celebration for Grandpa Clemens. Friends and family from across the country descended on Aunt Karen’s house to celebrate Grandpa’s birthday and share old stories. For more than a week Grandpa and I checked the mail everyday and opened birthday cards as he shared stories he remembered from each past student, distant cousin, and former neighbor. On Monday Mom and Tom headed back to Indiana and I settled in for another week of dedicated work. 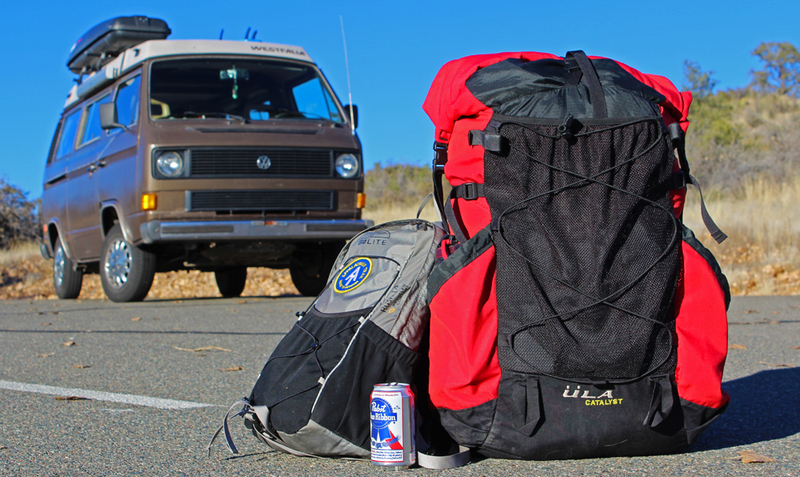 By the weekend I was ready for an adventure and had connected with another van dweller in Phoenix. 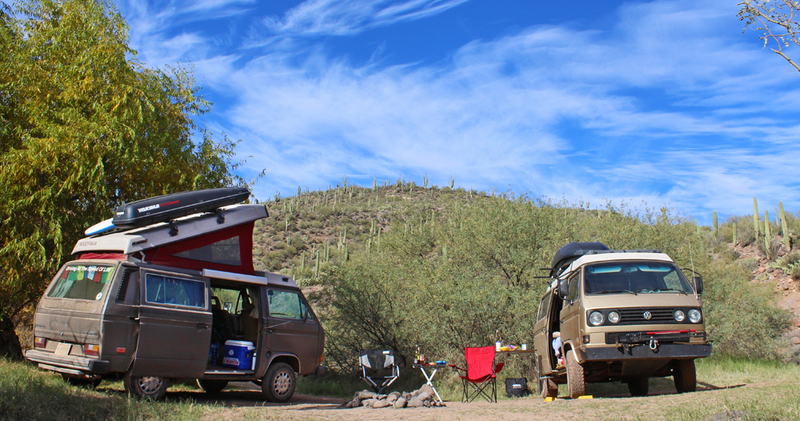 Saturday morning I met Anna and her van Halley and we rambled the Vanagons across 40 miles of rocky desert roads to camp at Sheep’s Bridge, an incredible hideaway along the Verde River. The drive back to town was just as challenging and I’m surprised that Tantor made it out unscathed. We cleaned up at the local gym and joined friends for the Trans-Siberian Orchestra concert, an incredible experience to say the least. I spent a few more days working in Prescott, frantically trying to catch up on freelance projects before another visitor arrived. During my road trip around the United States I took a chance and stopped by Charlotte, North Carolina to see a girl I’d had a crush on since college. The visit went well, and for our “3rd date” Brandy Hockersmith agreed to fly west to spend a few days with me and Tantor, vagabonding around Northern Arizona. I picked Brandy up from the airport in Phoenix and headed north to Flagstaff. 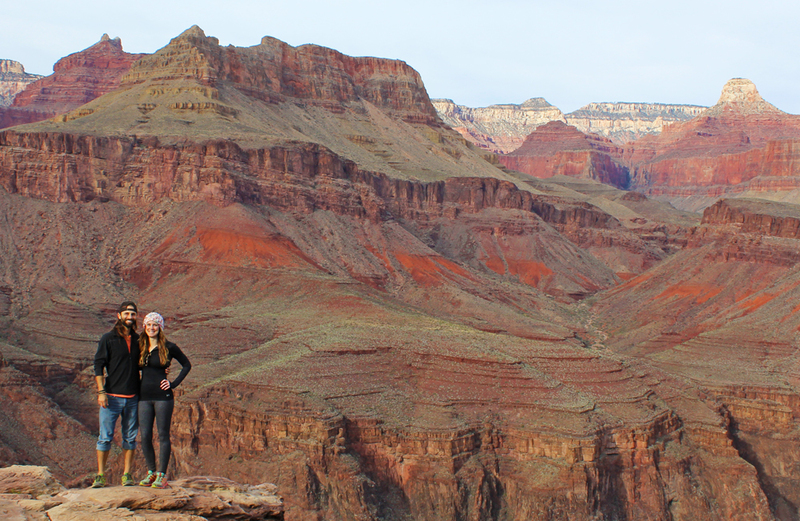 The next morning we stood at the South Rim of the Grand Canyon, Brandy’s first view of this incredible place. We laced up our trail running shoes and dipped below the horizon, following the Bright Angel Trail deep into the canyon. I didn’t know how much Brandy wanted to tackle, but once we reached Indian Garden she decided we should continue on to Plateau Point, a place that I’ve seen from the South Rim, but had never reached on foot. Plateau Point offered incredible panoramic views of the north and south walls, the Colorado River, and the deep gorge of the canyon to the east and west. We lingered, taking it all in, reluctantly turning to head back up the trail to reach the South Rim before dark. The hike out was arduous, as it always is when walking 6 miles straight up 3,000 feet, but we reached the South Rim and our cozy cabin just before sunset, in plenty of time for burgers and cold beers to celebrate the day. The next morning we awoke before sunrise and shivered as we watched the sun’s rays change the color palette of the canyon walls below us. From the Grand Canyon we drove south through Oak Creek Canyon and into Sedona for lunch and a quick hike. 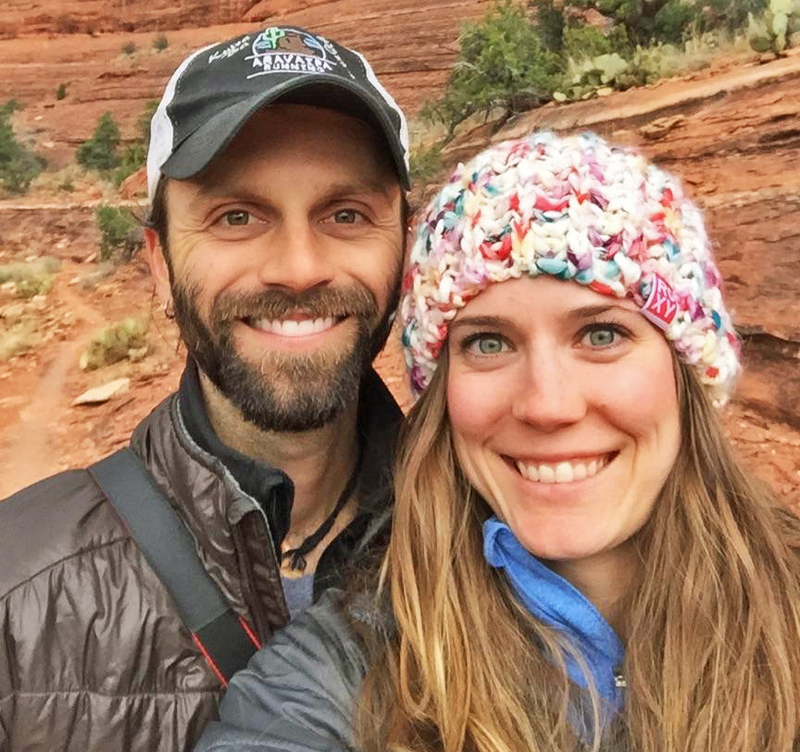 We had planned to spend more time in Sedona, but the weather thought otherwise and we were chased back to the van by rain clouds. That night we made it to Prescott and spent the evening playing Cards Against Humanity with my dad and step-mom, you know, the perfect way to introduce my girlfriend to my family. I wanted Brandy to see Jerome, so Dad, Kathy, Brandy, and I headed back up Mingus Mountain and over to the hippie ghost town. We visited the kaleidoscope store, enjoyed haunted burgers, and drove into Cottonwood for wine tasting before heading back to Prescott to meet Aunt Karen for dinner at the Prescott Brewing Company. The next day Brandy and I had coffee with Grandpa, visited with family, and packed her luggage to get back to the airport for her flight home to Charlotte. We really enjoyed our third date together, and I wasn’t exactly ready to see her go, but luckily I have very few responsibilities and am not tied to staying in one place, so in a few short days we’d be reunited for our 4th date on the other side of the country. The next few days were a whirlwind of activity. I helped Uncle Jim clear out a space in an unused garage by organizing items to sell on eBay, donate to Goodwill, or toss in the trash. After a few days of heavy lifting we cleared enough space for Tantor to pull in and park for winter hibernation. I also spent copious amounts of time watching YouTube videos about packing a backpack for long term international travel. I had enjoyed living in a van for the past few months, but was ready to embark on the new challenge of living, working, and traveling around the world in just a backpack. I packed and repacked my clothes, wondering how I would transition from living in an 80 square foot van to living out of a 60 liter backpack. Only time would tell. Finally, the day arrived. I parked Tantor in the garage and hugged him goodbye. I grabbed my ULA backpack that would be my “home” for the next 4 months and rode with my dad to the Phoenix Airport. I called Brandy one more time and confirmed that she still wanted a long haired homeless hippie dude to come see her in Charlotte. I’d thoroughly enjoyed my year of travel and living out of a van, but it was time for a change. I wanted to feel uncomfortable again, I wanted to be challenged, and most importantly, I wanted to follow my heart, and it was leading me to North Carolina. As always enjoyed reading your blog. Best wishes for the next adventure. I am envious. Love to you Tarzan.